State Senator Bill Monning, left, recipient of the 2016 California Ocean Champion Award, speaks at the Ocean Day reception hosted by Monterey Bay Aquarium. California is forging the path forward on climate leadership. This year, state leaders have made significant progress on policies to reduce our emissions of heat-trapping gases and mitigate the impact of changes already in motion. Today’s post comes from California Senator Bill Monning, the State Senate Majority Leader. Sen. Monning is the author of SB 1363, an important piece of climate legislation which the Monterey Bay Aquarium supported, and which Gov. Jerry Brown signed into law this year. In today’s guest post, Sen. Monning shares his thoughts on how restoring California’s eelgrass habitat can improve the resilience of our coast in the face of climate change. This past August, the California Legislature adjourned the 2015-2-16 Legislative Session, and once again we passed several bills that tackle the dire issue of climate change. We extended the state’s greenhouse gas reduction targets through 2030, committed state resources to clean up abandoned fishing and crabbing gear that entangles whales off the California coast, and passed Senate Bill (SB) 1363, which I authored, to restore eelgrass habitat and mitigate the impact of carbon dioxide on our atmosphere and ocean. Tiny animals called pteropods are among the marine creatures at risk in an acidifying ocean. SB 1363 requires the Ocean Protection Council (OPC), in coordination with the State Coastal Conservancy, to establish and administer the Ocean Acidification and Hypoxia Reduction Program. This measure was introduced in response to the April 2016 report by the West Coast Ocean Acidification and Hypoxia Science Panel and the Ocean Science Trust, in collaboration with the OPC. The panel’s science-based report tells us that ocean acidification is a global issue, and that California’s coast will experience some of the most severe and earliest changes in ocean carbon chemistry. However, the report also tells us that we can take steps to support ocean and coastal resilience in the face of these changes. One recommendation to help reverse the impacts of ocean acidification is the reestablishment of seagrasses, including eelgrass, along California’s coast. We might not think much about how our air travel affects sea snails, or how our light bulbs link with coral reefs. But on a planet where everything is connected, scientists continue to discover ways in which our carbon dioxide emissions touch life in the ocean. A baby octopus swims next to a pteropod, right. Shelled zooplankton like pteropods are especially vulnerable to increasing ocean acidity. Photo: Matt Wilson/Jay Clark, NOAA NMFS AFSC. On April 4, the California Ocean Science Trust released a report on one of the major impacts: ocean acidification. It occurs when the ocean absorbs some of the carbon pollution we’ve pumped into the air, triggering a chemical reaction that lowers the water’s pH. Acidic seawater makes it tougher for shelled marine animals to survive. The fragile shells of tiny sea snails called pteropods, for example, are thinning as the pH level drops. The impacts ripple through the marine food web, affecting many of our favorite seafood species. California aquaculturists have reported that baby oysters are dying off at higher rates because their shells aren’t forming properly. Acidification is happening across the world’s ocean. But the 20-member West Coast Ocean Acidification and Hypoxia Science Panel, which authored the report, found that the North American West Coast is getting hit especially hard, and particularly soon. Long-term observations by our sea otter scientists confirm that sea otters are transforming the Elkhorn Slough estuary, in positive ways, by devouring predators that keep eelgrass beds from thriving. We’ve told the story before, in words and pictures. For Sea Otter Awareness Week, we’ve created a simple infographic to document the relationships. You can read more on the aquarium’s general interest Tumblr blog. Michelle Staedler stands atop a hill above Elkhorn Slough. It’s low tide – low enough to see the green eelgrass just under the surface of the water. Michelle peers through a spotting scope with a directional radio antenna attached. Static hums on the radio until it’s broken by a quiet blip…blip…blip coming from a radio tag inside the abdomen of a sea otter. Michelle records the time and notes that the otter she’s been watching for the last fifteen minutes, 501, has come up with a clam that she shares with her pup, floating by her side. Michelle is recording foraging data on Otter 501, perhaps the most famous sea otter in the history of the Monterey Bay Aquarium’s otter surrogacy program. Rescued as a pup by the Aquarium and raised in captivity, she was successfully released in 2011 into Elkhorn Slough, a major estuary system in Moss Landing that feeds into Monterey Bay. Otter 501 has gone on to raise several pups of her own in the slough, where many of her species have come to flourish. 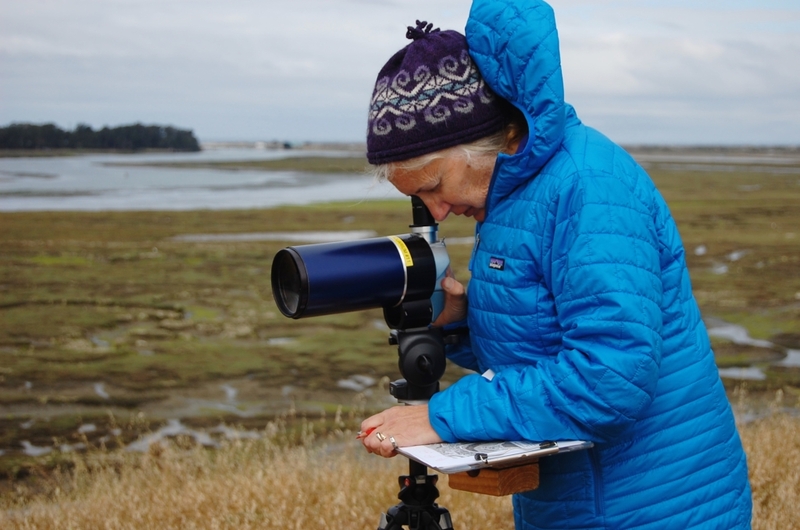 Michelle and her collaborators at the U.S. Geological Survey and the Elkhorn Slough National Estuarine Research Reserve have been counting otters in the slough since September 2013 as part of a population monitoring project. She has conducted several research projects on sea otter behavior since she began working with the Aquarium nearly 30 years ago. Her work focuses on sea otter mothers, their pups and how they feed. Foraging data gathered in the slough has proven particularly useful to ecological research. Sea otters are a keystone species – central to the overall health of ecosystems of which they’re a part. Like other top ocean predators, their presence helps maintain a diverse community of animals and plants. The web can unravel if otter numbers dwindle. That’s exactly what happened when they were hunted to near-extinction by fur traders in the 18th and 19th centuries. 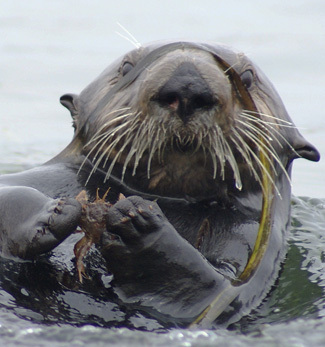 In kelp forests, otters eat sea urchins and other grazing animals, keeping them from devouring the kelp. This allows the productive ecosystem to thrive. Using several data sets, including Michelle’s extensive foraging data, researchers at the University of California, Santa Cruz discovered that otters play an equally important role in the slough. 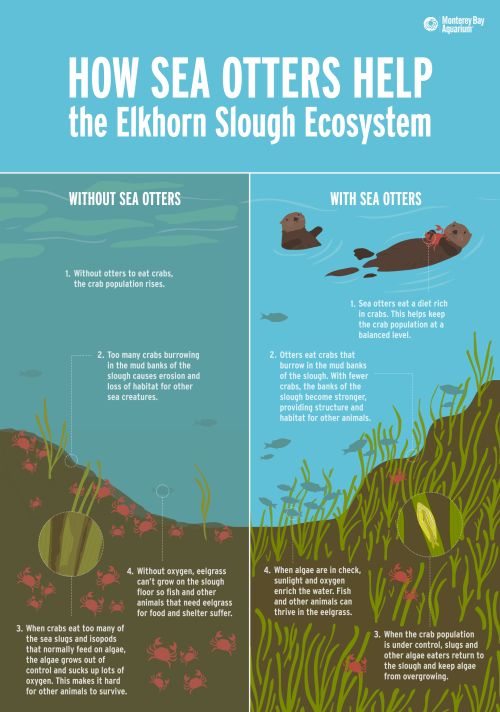 As the story goes, before the otter population bounced back in the mid-1980s, eelgrass beds in the slough were being smothered by algae that grew unchecked on the leaves, absorbing the sunlight eelgrass needed for photosynthesis. 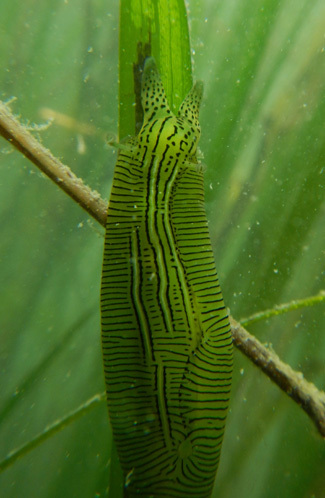 In a healthy ecosystem, snails, slugs and other invertebrates would eat the film of algae, cleaning the grass and allowing it to get the sunlight it needs. But those grazers were being devoured by crabs, which had few natural predators in the slough – that is until sea otters turned up and began gobbling up the crabs. Brent Hughes, who led the UC Santa Cruz research team, said he couldn’t have cinched his conclusion without the help of Michelle’s data. It’s important that she and her colleagues continue to monitor the otters, as well. For example, she said, a pioneer population of about 20 sea otters used to live around the jetty system in Moss Landing Harbor, at the mouth of the slough. Over time, their numbers ballooned to over 100 animals, and she’s observed them moving farther and farther up into the slough. Because of the significant restorative impact the otters can have on the ecosystem, it’s critical for researchers keep an eye on them to see what happens if their numbers continue to grow, Brent said.